Every Country Gets the President She Deserves. Issue 111: King of the Hill! Part 1. 25th April 1987. This week this project reaches something of a landmark, as a third of the way through issue 111 is the point where I have covered exactly a third of the Marvel UK comic. 111 down, just 221 to go, it's starting to feel like I might actually get to the end of this without some form of comedy aneurysm. This is also a nice issue for such a landmark, in that it's important to the overall mythology of the comic, establishing both the new leaders on each side and the general direction the American stories will take for the next couple of years. It's also one of the more successful examples of an American story being split in two, not only do we get an impressive full page cliff-hanger but also bookends with the human characters stumbling on a giant robot dinosaur. Thankfully these humans are not on the Mechanic level of annoying, just being a group of palaeontology students and their teacher investigating giant robot dinosaur footprints in the Cascades. You'd have thought anyone stumbling across giant footprints in Oregon would, after two and a half years, automatically react with a scream of "ARRRGHHHHHHHH IT'S THOSE FAMOUS GIANT ROBOTS THAT HAVE BEEN TERRORISING THE AREA! RUN! IN RETROSPECT WANDERING THEIR STOMPING GROUND FOR ACADEMIC STUDY WAS PROBABLY A SILLY THING TO DO! ", but instead the teacher laughs it off as an elaborate hoax until they see Swoop fly past. Yes, it's the return of the Dinobots to the American stories after a massive absence, other than their brief cameo to explain their not taking part in Command Performances! they've not been seen in a Bob story since Repeat Performance! (obviously anything with the word "Performance" in the title will get Grimlock out of bed) ended way back when in issue 28. It's clear that up to now Budiansky hasn't had much of an interest in the characters, but that is about to change in a rather drastic way. On the surface what should happen at this point seems obvious, Optimus and Megatron have been written out of the comic at almost exactly the same time the toyline (and film) has introduced new leader toys to replace them, it should be inevitable that they would now turn up to assume the same role here. There are two reasons why this doesn't happen. From Hasbro's point of view Bob's plans for this period of the comic would have been approved at the point they were still expecting the film to be such a massively insane blockbuster that the comic wouldn't be needed to promote the toys outside of the adaptation, they would have felt able to indulge Marvel and effectively let the book ignore the bulk of the mid-1986 toys. From Bob's perspective, the movie characters are the first he played no part in the development of, and anyone who has read their less than enthusiastic Universe profiles will have spotted he had little interest in them, finding an excuse to ignore them and focus on his own creations was always have been the most appealing option if he could get away with it. Also, Bob is by this point straining at the leash and keen to move on from the book, and also bored with the more conventional heroism and villainy of Prime and Megatron. Making a dumb thug like Grimlock Autobot leader and a anally retentive accountant like Ratbat in charge of the Cybertron based Decepticons is not only a way of keeping things interesting, it's a small act of rebellion against a job that was starting to feel more like a prison than a creative outlet. 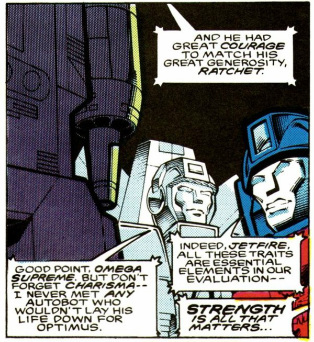 This is something that will never happen again, tellingly later in 1987 all the Movie characters who had their toys reissued as Targetmasters are included in the comic whether Bob likes it or not (and the fairly half arsed way Hot Rod and the others are featured makes it clear that the passage of time has not made him more fond of them). It's interesting to wonder how the British stories would have coped if Rodimus and Galvatron had simply been introduced as present day characters here. Would Furman have known long enough in advance for Target: 2006 not to happen (though presumably Hasbro UK would have still wanted some sort of film tie in)? Or would some sort of elaborate work around akin to what we'll be getting for Cyclonus and Scourge in early '88 have been needed? England's world cup is dissected by the FA. Either way, the run of American stories starting here arguably sees Bob enjoy the greatest level of creative freedom he'll ever know on the book. This may not automatically be a good thing, but we'll be going to some interesting places with it. One worrying change of direction, either as a result of not remembering how the character talked before or simply to make a greater contrast to Prime, is that the descent of Grimlock into his TV persona really kicks in here. It's not at "Me Grimlock" level yet, but the sentences are short, simple and don't make him seem terribly bright. Compared to the character of the UK stories it's rather a shock, and we're still a few weeks away from the worst of it. 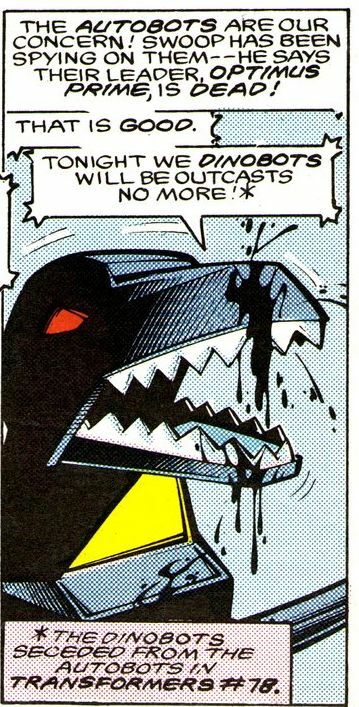 On the other hand, the scene of them stealing an oil tanker (thankfully the driver is no Bomber Bill and doesn't give chase) and then guzzling down on its contents whilst mocking the general stupidity of humans is both fun and neatly sets up Grimlock's character arc for this story. At the Ark we get an even more worrying omen of things to come as a council of the highest ranking Autobots (of which Jetfire and Ratchet are the only characters to have been on Earth for a substantial amount of time, poor old Wheeljack must be looking daggers at Johnny come latey Hot Spot) meet to decide who their new leader should be, but instead prove to be a bunch of indecisive and ineffectual prattlers who can't agree on anything. 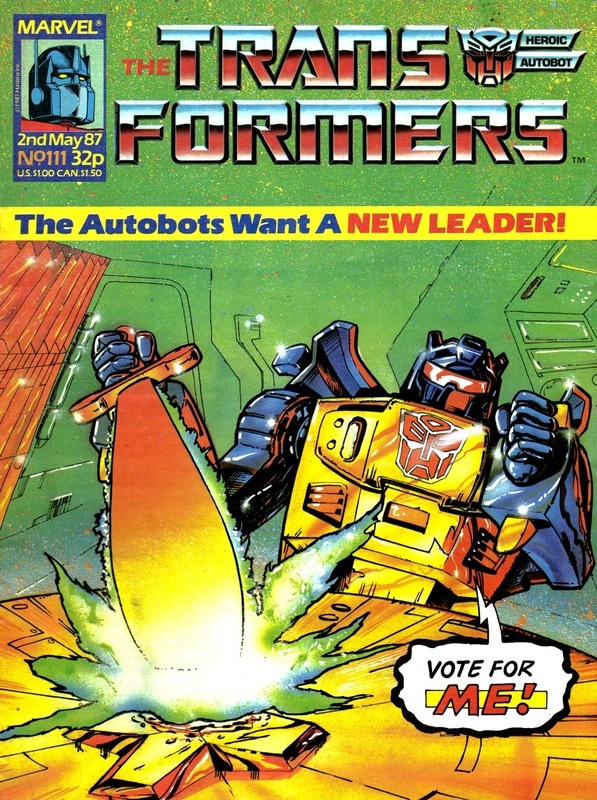 That level of wishy washy uselessness is going to the root of most of the Autobots problems when dealing with their new leader over the next two years, and it's no surprise that when Grimlock smashes his way in to demand the job that their protestations are as effective as a wet paper towel. Roland Rat saved TV AM. Over at the Decepticon's new fake island base (did the government not notice this island has appeared from nowhere?) 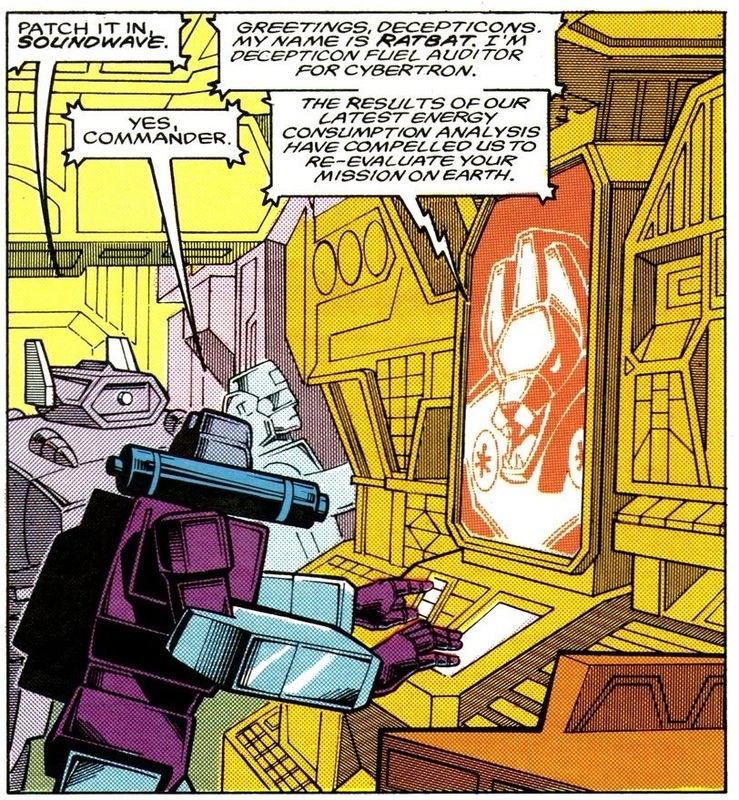 Shockwave is having a rather ineffectual time of it as well, he may have claimed the Earth based leadership but he's still dependant on Cybertron for supplies and troops, and as such has to kowtow to chief fuel auditor (he's not actually called full on leader at this point) Ratbat. Whilst this is very much the point where Shockwave begins his decline, Ratbat is in and of himself a fantastically left field choice for leader, not a power hungry dictator but a penny pinching bureaucrat who judges the Earth mission a failure just from a cost perspective. It's a surprisingly mature gag- especially for the issue surrounding it- and one that Bob is going to successfully mine for the next few years in a way that suggests that is where his heart really lies. Poor old Shockwave is reduced to begging for one last bit of help from Cybertron, that Ratbat send over what they need to take over the Ark permanently, in a scene that can't help but make you squirm on his behalf. This leads to our big splash page cliff-hanger as student Rachel Becker (another pert young blonde following the likes of Charlene, Jesse and pre-Breaker Josie, I'd say Budiansky had a Hitchcock thing going on if not for the fact that Furman will be introducing his own in a few weeks) is brought out of her tent by a noise and stumbles across the freshly arrived Trypticon stomping through the woods. This isn't at the same level as the last issue and does suffer from the writing of the Autobots, especially with the hindsight of knowing where this will lead. However, Ratbat is already brilliant and at worse it's a harmless enough read. 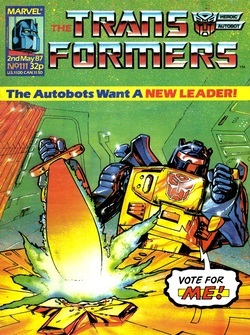 The cover of Grimlock shouting "Vote for me!" is a nice topical gag referring to the forthcoming 1987 elections. Of course, there's no commonality between Grimlock and Thatcher, after all, the one is a crazed war monger who somehow managed to become leader despite decreasing popularity and descent into self parody, whilst the other is a giant robot. Transformation uses the sidebar to make the first of what I suspect will be several attempts to make readers care about the floundering Action Force comic by bigging up the arrival of Zartan (also in shops now kids) as much as it possibly can. I also suspect more kids learnt about him this way rather than reading his own comic. Thankfully letters page Grimlock can still string a sentence together, and for the second week in a row has to assure a reader, Nashat Siddiqui of London, that the book is for readers of all ages and not just "toddlers". We also get the first letter from an American since the dollar price was put on the cover, and for his pains Caleb Jones of West Linn has Grimlock mock his accent. Though impressively Grimlock also offers to send the Yank some copies of Target: 2006 if he can't find them in specialist stores states-side. The Inhumanoids begin their third original issue with the team recovering from the attack on their base. We also get eye patch man revealing to his sister he wants Earth Corps shut down and that he thinks he can control the monsters. This leads to him having to try and kidnap her when just brushing her off and not telling her anything would have been much simpler. He also manages to seem even more incompetent as she succeeds in driving off from his goons easily. 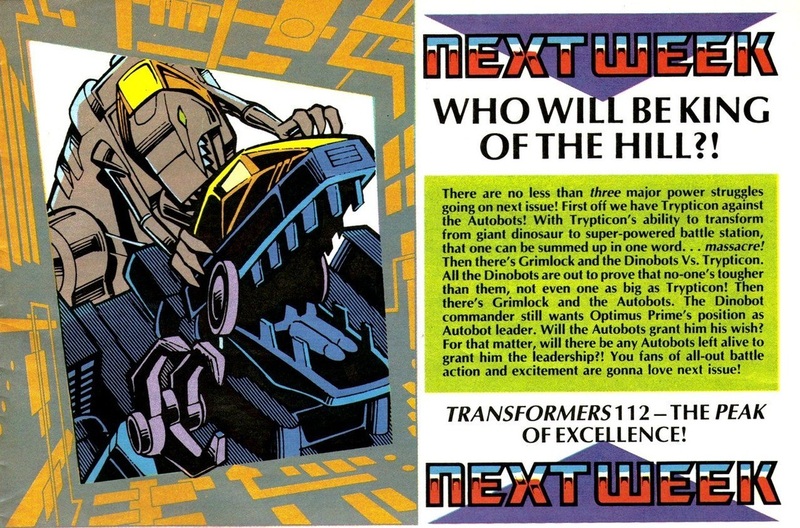 Next week, it's a grim day for the Autobot leadership challenge. Also out today (Friday 27th of June for those reading in the future) is the first issue of volume five of the current British Transformers comic based around Age of Extinction. It’s very much in the same vein as the previous version of the comic, but the Prime figurine that comes as a free gift is just darling.